I got my chance to climb back in the pilot seat of my old friend to bring it home. Restoring a Skywagon for a friend. N3115D has never left my mind. That Skywagon was an achievement that brought satisfaction and pleasure to me, and the learning I had throughout the building and flying experiences taught me more than I can express. It has a place in my past that is special. After it left me it went to a new home about 200 miles south and I didn’t see it again for about 5 years. It sat in its new home at a private airpark and flew a total of about 20 hours in that period of time. I was aware of where the airplane was and I occasionally spoke with the owner and knew the airplane was not getting much use. At one point he told me he was considering selling it and asked me to pass the word around. Meanwhile another friend and client, Ron, was flying a 180 and had an unfortunate accident, totaling the airplane. When the insurance company settled with him he began to look for another Skywagon. He asked me to look into 15D for him and soon we were on our way to southern Utah to see it. As I approached the airplane my heart skipped a beat because I had forgotten how pristine this airplane was. There was no reason not to give Ron a thumbs up for my approval of the airplane. A deal was made and I got my chance to climb back in the pilot seat of my old friend to bring it home. Now, back home at Skypark, my 185 Skywagon had a new sister ship. I had designed the scheme and picked the colors and still liked it enough to recreate it on the 185. I likely would have done something different the second time around had I known they would both reside at the same airport again. Ron and I flew 15D a lot together while he got comfortable with it. This was no big sacrifice for me because it gave me the chance to get reacquainted with it. Now that I had an emotional attachment to my 185 Skywagon I was better able to maintain mental balance regarding my loyalties to the 180. I had come to terms with the fact that it was not my airplane any more. What a great flying and performing airplane! I had forgotten how impressive the takeoff performance was and how smooth the engine ran. Over the next year I flew as an instructor with Ron on and off and always looked forward to the chance to get in it. I suppose one thing you can count on in life is change, and unfortunately change occurred with 15D. Fate took a turn for the worse when Ron lost control of the aircraft on take off at a fly in, in central Utah. A very strong gust of wind forced the airplane to deviate from the runway. The right wingtip drug on the pavement during the unanticipated swerve and as the aircraft left the runway it went through a ditch running parallel. The right main gear was instantly ripped from the airplane. The engine was at take off power and the subsequent prop strike was disastrous, twisting and bending the blades as well a breaking them loose from the hub. The fuselage, landing gear, right wing and cowling were badly damaged. The horizontal stab, right elevator, flap and aileron also were damaged. I had been out of town and did not hear about the incident until the next day when Ron told me the sad story. I was happy to hear no one was injured but very disappointed to know of the condition of the airplane. I knew it would probably be a total loss as far as the insurance company was concerned. Because a landing gearbox had been torn from the airframe the damage was substantial to the fuselage. The heavy spring gear leg had been ripped along with its support bracing bringing with it torn and twisted pieces of metal, wiring and brake hoses. The cabin floor was buckled and twisted and the lower doorframe was torn apart. The loose gear leg, now attached by only shards of sheet metal flew aft and impacted the belly of the airplane on the right side caving in the area. I studied dozens of photographs in my efforts to determine the extent of damage and was saddened, believing the old Skywagon would be headed for the scrap yard. I knew the aircraft could be rebuilt, but also believed it was beyond the scope of what I could do and, I was sure the insurance company would call it a total loss. Some of the parts for these older aircraft have become very hard to come by, others completely unavailable and still others prohibitively expensive. These conditions, along with the labor intensive nature of the repairs often make repair costs exceed the hull value. Sometimes even seemingly minor damage can result in insurance companies totaling aircraft. They can easily become worth more in parts than in flying condition. One of the premier repair shops was sent out to retrieve the Skywagon from where it sat and assess its condition for repair. As I expected, the estimate puts costs above the limit allowed by the insurance company. It also did not include any budget for contingencies such as hidden damage that may be discovered. This was disappointing news for Ron and myself. Not wanting to lose the aircraft, a number of discussions took place with the insurance company to find a solution. An aircraft salvage value was established and an agreement was made that the insurance company would pay out the claim to its maximum allowable minus the aircraft salvage value. Ron would take the money from the salvage and pay for the repairs himself along with any additional costs that may be incurred. The hope would be that the repairs could actually be completed for the bid amount but the insurance company would not be responsible for any further expenses. Although I was doing my best to advise Ron during this time as best I could, I was thinking I would not have any part of the repair process, at least until Ron brought up the idea of having my shop do the repair. At first I was decided I would not pursue it. Its not that I wasn’t interested, because I was, its that I felt it was just too much for my little shop to do. I have done plenty of rebuild jobs, but without a fuselage jig and experience doing a gearbox repair I felt it was beyond my reasonable capability. Then I made a call to a guy I know and everything began to change. He happened to have a “clean” low time fuselage assembly and wing available for me to purchase. As I did the math I concluded that it may be possible to economically replace, rather than rebuild the fuselage and wing. This replacement fuselage was actually a 53 model, and would require a few changes but the basic airframe was the same. I estimated the time and costs that I anticipated it would take to do all the work and came up with a number that was comparable with the original estimate. There were a lot of unknowns but I believed I could keep the costs in line and bring the airplane back to life. The decision was made to proceed and arrangements were made to have the wrecked Skywagon, as well as the fuselage and wing, shipped to Utah. The 8 months I expected the project to take turned into 18 months. My plans never seem to include a large enough time budget to deal with the host of problems that come up during a big job like this. The “low time, clean” airframe was actually in fairly good condition, but not nearly as nice as I needed it to be. There were multiple repairs required and the entire airframe was caked with 60 years of dirt and debris. A large hole where an antenna had been located on the fuselage back had to be repaired. Multiple dents and minor damage was found on the belly. We struggled to make the windshield and the engine mount fit. The baggage door and framework had to be transferred from the wreck and its installation required at least 4 times the labor I planned because of various problems. The cleanup of the interior fuselage was very labor intensive and seemed never be “good enough” in my view. It took untold hours to clean the dirt, hydraulic fluid, oil and other residue that had accumulated inside the airframe over the years. Where do you stop when you are trying to make something perfect, while still trying to make a profit? When I built the airplane the first time it didn’t matter how long it would take to get it the way I wanted it to be. I was only accountable to myself for the time I spent and the extra months or even years it might take to get it right. Now I had time constraints. This effort to balance the desire I had to make the airplane as perfect as it was before and the need to finish in a timely and efficient manner was very challenging and frustrating at times. These hardships also become a driving force in myself and I find satisfaction and enjoyment in overcoming them. Each time the airplane seemed to become difficult and troublesome we focused our efforts and found solutions. The battle never let up. I broke my hip at one year into the project. This left me nearly unable to function for awhile and was a major setback. I spent many days working on installing the instrument panel and wiring, all while hobbling around on crutches and unable to have any real function of my leg. And to make matters worse the fellow who works for me happened to break his hip 3 days after I did mine. What luck. He struggled for weeks transferring wing fuel tanks and installing a stol kit and wing extensions on the wings while nursing a swollen and painful leg. We each performed at best, poorly, taking 3 or 4 times as long to do even the simplest jobs. The progress slowed dramatically during this time. Work loads in the shop would become very high at times and impacted the progress also. With 4 or 5 airplanes torn down for annual inspections or repairs, finding time to move the 180 forward became hard, to say the least. Persistence pays off however, and the day came when we ran out of parts to install. We pushed the airplane out into the bright sunlight and cranked the engine. It immediately roared to life and seemed to beg for its chance to get off the ground once again. 3 ground runs, a taxi test and a few adjustments later I was plugging the headsets into the jacks, contemplating this “first” flight, now for the second time in an airplane I was extremely familiar with. I know practically every rivet in this old Skywagon and I can see every cable, every bolt, in fact every single part in my mind. There is no place I have not been, no place I have not touched and no system I do not understand. As I pushed the throttle to the stop the plane leapt into the air, just as it did years before when I sat in the same seat, on the same runway, with the same intent . It flew perfectly, ran smooth and strong and worked almost flawless. As I made my approach I was reminded of the near perfect landing from that first “first” flight and felt the pressure to make this one just as good. Maybe it’s the airplane that took over and simply let me ride along because it gracefully rolled the wheels on to the runway with seeming no help from me. No one can tell me this airplane does not have a spirit. 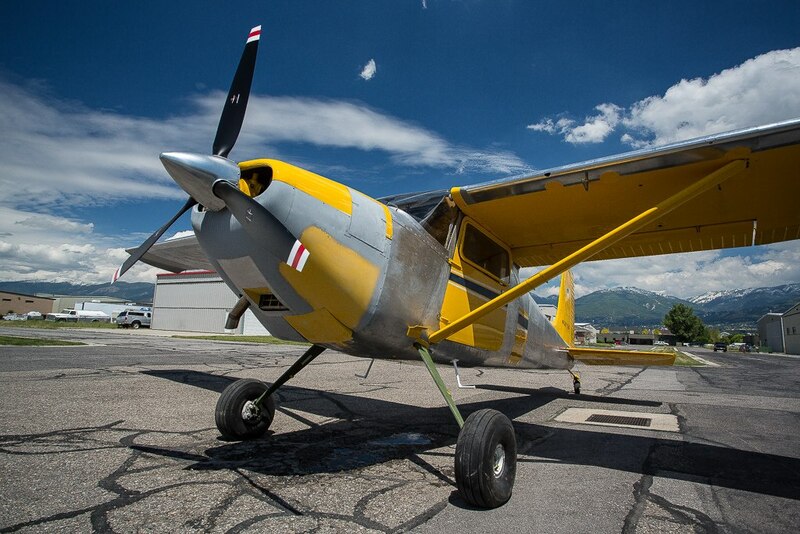 In case you missed them, here are the previous installments in this story, Tailwheel Part 1 and Tailwheel Part 2.